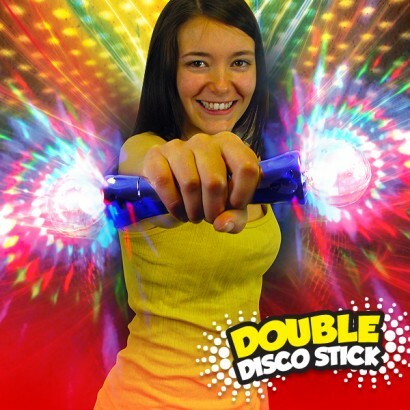 A handheld LED disco stick that casts bright colourful light projections from the clear crystal disco balls at either end. Colourful LED's project light in three funky modes that work best in a darkened atmosphere. 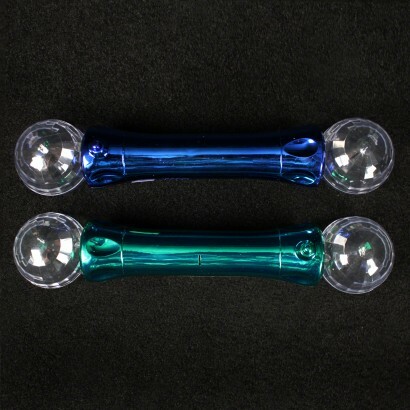 The handle comes in either green or blue. Project disco lighting effects off surfaces! Really effective lighting.... all loved them from 10 month old to the grown ups..... even pet cats thought they were fun!! However they look a little worse for ware, the coloured handles were already losing colour, a bit fragile and I'm pretty sure they won't last too long, but priceless look on the little faces? Worth every penny!! These are perfect for sensory workshops and disco fun. I originally bought 3 and then went and ordered a load more they are so fun! Kids of all ages love them!